These vinyl pants are just too fun. I have had them for a few months, but was always to apprehensive to wear them around. I thought they were a little “extra” – but you know what? You never NEED a reason to wear patent pants, you just wear them. After my shoot here I ran a few errands and got so many compliments on my pants from the most random people. A mom with her daughter, a construction worker, a guy that works at a pot shop – they all were raving about my vinyl pants! I gave my new eye shadow palette by e.l.f a try. I used the 90’s palette, which is inspired by the decade. I normally don’t attempt crazy makeup looks but I wanted to try something different and challenge myself. 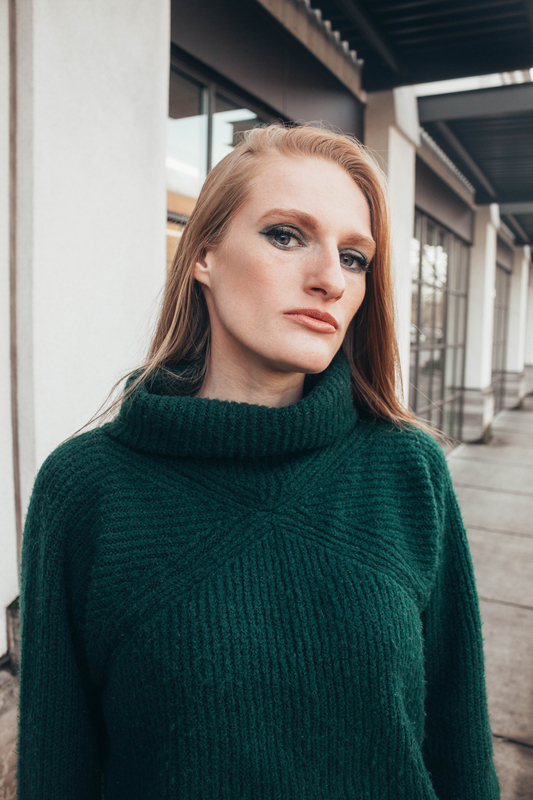 I think the green eye shadow looked really good with my green sweater, and it made me eyes pop! I have been living in this sweater all winter long! It is so cozy and I love the loose turtleneck aspect. 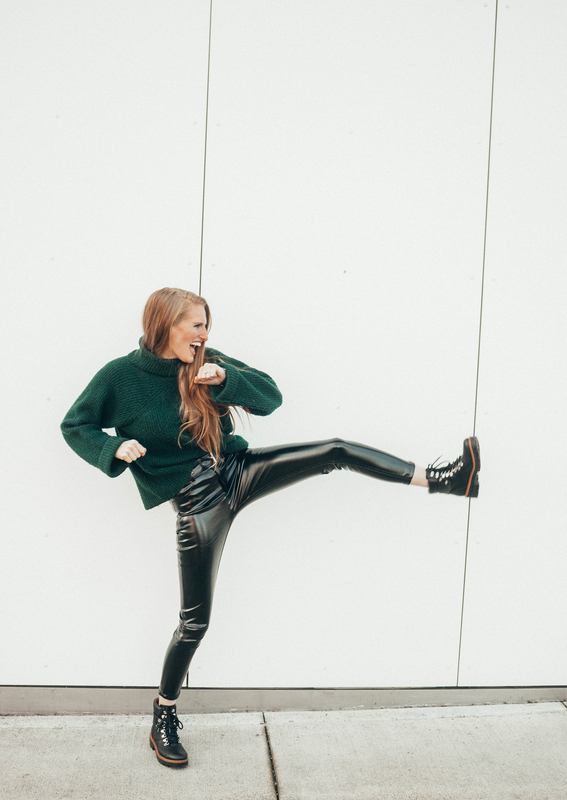 Paired with my favorite combat boots, and some edgy eye makeup – this outfit makes me feel (and look) like a total badass! I remember my photographer telling me to pose like this was for my album cover – hence all the fun and crazy poses. I like to have fun and do silly things during my shoots because it makes me feel less awkward. I know I have been doing this for years, but I still get a bit camera shy. Putting myself out there helps calm me down and you never know, that crazy pose could be the shot you never knew you wanted! I am obsessed with those kind of pants. You look absolutely stunning in them too. Oh my gosh you are so chic! These pants look amazing on you! And I love how you styled it with that green top and boots! This is misleading – every photo is the same outfit with different poses? No styling tips? I’m sorry I didn’t write step-by-step tips. In all honesty I added the “How to Style” for SEO purposes – my title wasn’t long enough. But if you read the post, the message was that you never need a reason to wear the vinyl pants – just wear them. It’s more about the confidence to wear them then how to style them with different looks. I’ve been seeing these pants everywhere and I am here for it. They are so cute on you! YES GIRL. These are SO FIRE on you. Those pants are so fun! You look great in them, of course. I am honestly surprised that you can move so much in them. They always look great but they don’t look like they would be super comfortable. You are rocking those pants!! I love them on you! SUPER in love with this!!!!! Obsessed with those pants and love how you styled them! Nice outfit! Loved the vinyl pants. super cool and edgy! Love how you styled it with boots and a nice sweater. Also, you makeup is on point! This look is killer! I don’t think I could pull these pants off as well as you– you look incredible! You are a badass in this outfit!! Looking fabulous, girl!! 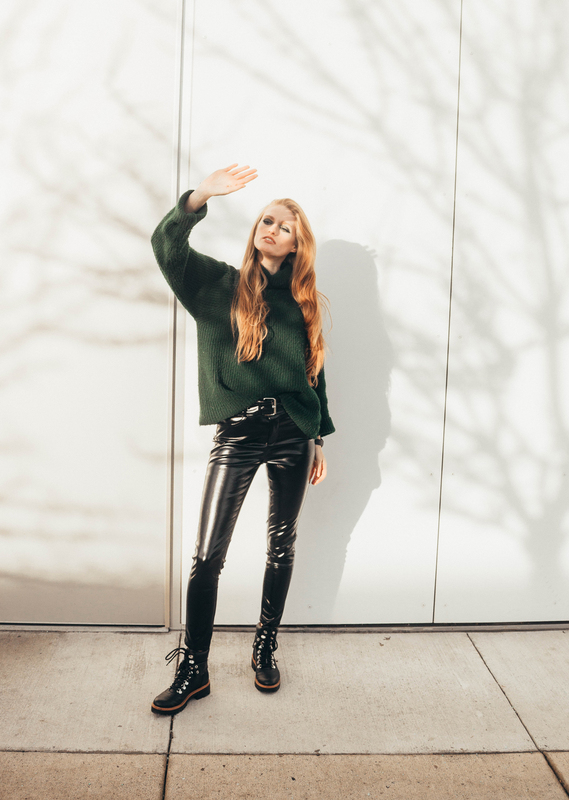 I love how you styled these vinyl pants with a casual sweater! Makes it look easy to wear! Love these pants and the pop of green! Your boots are so chic, will buy them ASAP! Such a great way to style these for everyday wear! 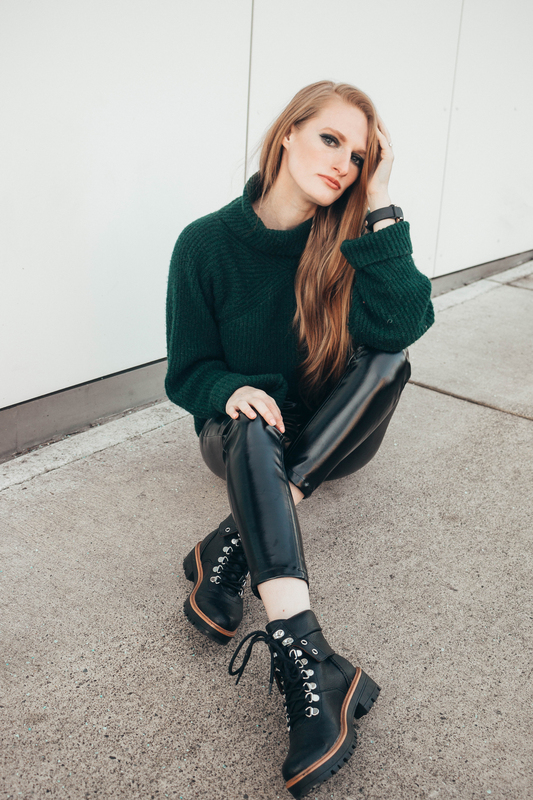 I actually LOVE leather leggings and find them to be a staple in my own wardrobe! I have been dying to have a pair of these! I love that these have .a belt and you can tuck something into it! I love the sweater tucked into it and love them with the boots. This is such a killer look!